The Nine Banded Armadillo (Dasypus novemcinctus) in greater Nashville are prolific diggers and excavate land burrowing and for food. Armadillos are a growing problem in Brentwood and Franklin over the past several years, as they are becoming common in the area. They cause a lot of damage to lawns and gardens in just one night searching for food. Armadillos will burrow into yards and under buildings and dig up plants or crops as they dig for grubs. This makes an armadillo an expensive nuisance. Trapping armadillos and removing them is the best way to control the problem. Our armadillo removal step-by-step solutions will effectively solve armadillo problems permanently. Humane, Poison free, trapping and removal solutions. Complete exterior seal-up of the residential or commercial structure. Guaranteed work, with a warranty you can count on. 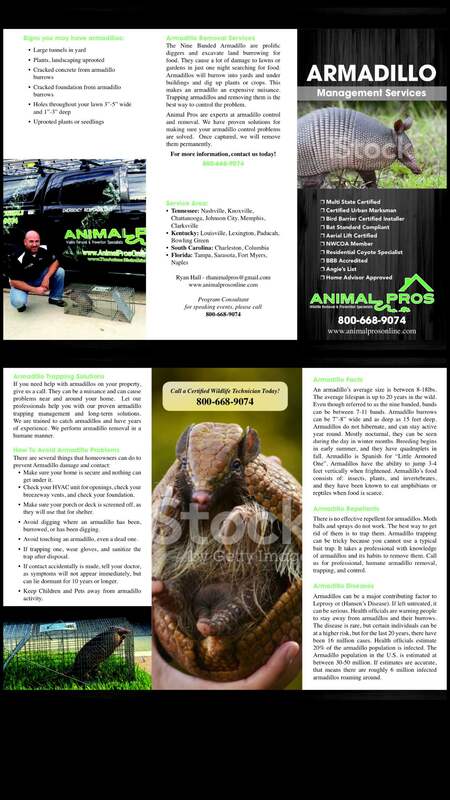 We specialize in armadillo and other wildlife. If you have armadillos on your property, Animal Pros are experts at armadillo removal. Armadillos are a a destructive nuisance in Nashville, Franklin, Brentwood, and Middle Tennessee. 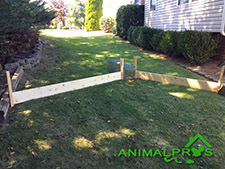 Animal Pros has proven solutions for making sure your armadillo control problems are solved. Once captured, we will remove the armadillos. If you notice digging in your lawn, garden or flowerbed you may have an armadillo problem. We have complete armadillo control and removal services. If you need help with armadillos on your property, give us a call. They can be a nuisance that can cause problems near and around your home. 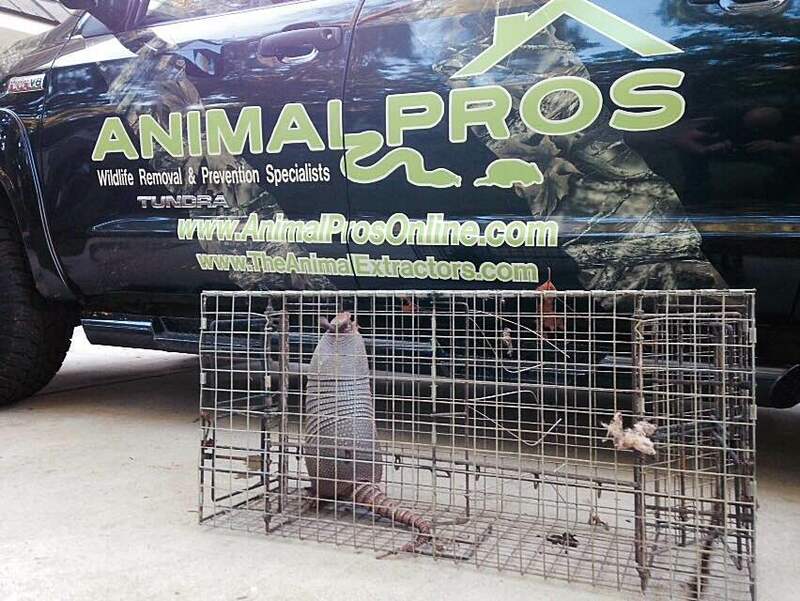 Let our professionals help with your armadillo trapping the right way. We will help you with professional armadillo trapping in Nashville area wide. We are trained to catch armadillos and have years of experience. We perform armadillo removal in a humane manner. Armadillos under deck or porch. Getting rid of armadillos can be a challenging task, but with some helpful tips, you can secure a area of armadillo damage. Armadillos do not see very well, but can excavate ground with extreme ease. If you have burrows on your property, this is the best sign to look for and can make trapping 100% successful if the burrow currently in use. Follow these tips for getting rid of armadillos. Fencing of damaged area using plastic netting and stakes. Make a barrier that closes off affected area. If burrows are present, make a barrier around the burrow funnelling the armadillo in a live trap. Once a armadillo is captured, repeat the process to ensure no more armadillos are present. In cases of extreme damage or unsuccessful attempt at capture, call a professional. Armadillos can carry disease, as professional help is always suggested. Diet: Omnivorous, eating both plant and animal matter. Reproduction: 4 quadruplets born once annually starting in April. Habitat: Urban areas with the availability of food water and shelter, fence rows, drainage ditches, under sheds, and dense under growth. Legal Status: Common throughout Tennessee, and required to be euthanized if trapped according to the Tennessee Wildlife Resources Agency. It is illegal to transport or release armadillos in Tennessee. Other Names: Opossum in half shell, hoovering hog, and poor mans pork. Interesting Facts: Armadillos can jump 3-4 feet straight up in the air. They can detect food in the ground as deep as 8″ or more. Their burrows may be up to 25 feet long. Armadillos can be a major contributing factor to Leprosy or (Hansen’s Disease). If left untreated, it can be serious. Health officials are warning people to stay away from armadillos, and even digging in ground where armadillo burrows are. The disease is rare, but certain individuals can be at a higher risk, but for the last 20 years, there has been 16 million cases. Health officials estimate 20% of the armadillo population is infected. Hope your sitting down! The Armadillo population in the U.S. is estimated at between 30-50 million. If estimates are accurate that is roughly 6 million infected armadillos around. There are several things that homeowners can do to prevent Armadillo damage and contact. (1) Make sure your home is secure and nothing can get under it. Check your HVAC unit for openings, check your breezeway vents, and check your foundation. (2) Make sure your porch or deck is screened off, as they will use that for shelter. (3) Avoid digging where a armadillo has been, burrowed, or has been digging. (4) Avoid touching a armadillo, even a dead one. (5) If trapping one , wear gloves, and sanitize the trap after disposal. (6) If contact accidentally is made, tell your doctor, as symptoms will not appear immediately, but can lie dormant for 10 years or longer. (7) Keep Children and Pets away from armadillo activity. Armadillos average size is between 8-18lbs. The average lifespan is up to 20 years in the wild. Even though referred to as the Nine banded, bands can be between 7-11 bands. Armadillo burrows can be 7″-8″ wide and as deep as 15′. Armadillos do not hibernate, and can stay active year round. Mostly nocturnal, they can be seen during the day in winter months. Breeding begins in early summer, and they have quadruplets in fall. Armadillo is Spanish for “Little Armored One”. Armadillos have the ability to jump 3-4 ft vertically when frightened. Armadillos food consists of insects , plants, and invertebrates, and they have been known to eat amphibians or reptiles when food is scarce. There is no effective repellent for armadillos. Moth Balls and Sprays do not work. The best way to get rid of them is to trap them. 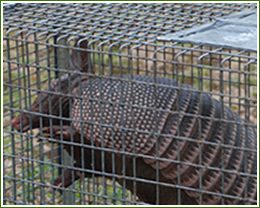 Armadillo trapping can be tricky because you can not use a typical bait trap. It takes a professional with knowledge of armadillos and its habits to remove them. Call us for professional, humane armadillo removal, trapping, and control. © Animal Pros. All Rights Reserved.